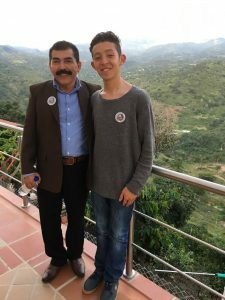 Early in April 2017 Pastor Alvaros Berrios of Nicaragua wrote to us and invited us to join him in Colombia South America at a conference of Youth and Youth Mission Trainers. This was scheduled for June 2017. 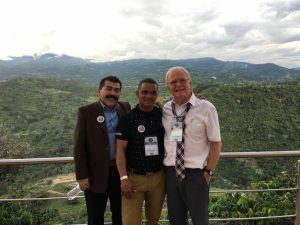 I had been friends with Pastor Alvaros of Nicaragua for several years and had been planning to minister for him in Nicaragua at a Conference on Unity and the Bride but so far had not been able to do so. 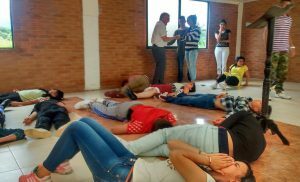 This was an opportunity to move into South America which was not to be missed. 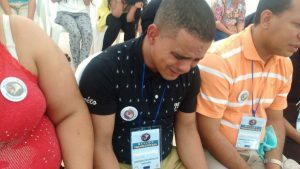 Although the event was not particularly about the Bride we felt sure the Lord wanted Call2Come to take part and then see what connections He would build for us for the future in S America. 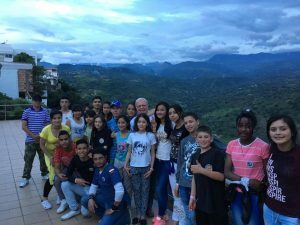 Pastor Henry Lopez who directed this Youth Missionary Training school in Colombia had for years been successfully following a vision to take disadvantaged and troublesome youth into his and his wife’s care and provide for them a sound Christian Education and Missionary Training. 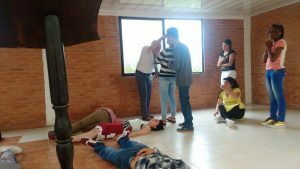 He has seen the Lord save them and transform them and build them into an army of dedicated Youth Missionaries. 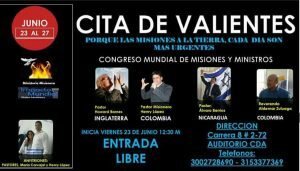 Call2Come was blessed to be a part of his conference and of course a joy to work close with Alvaros Berrios. 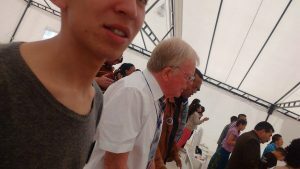 Howard was given a young man of God Kenneth Mendivelso Tijo to translate and inerpret for him.This was of Gods doing. Pastor Alvaros and Kenneth Tijo and other S American delegates at the hotel/conference centre. Dr Howard and Kenneth became very close friends and stayed together as ‘Jonathan and David’ for the rest of the Mission. 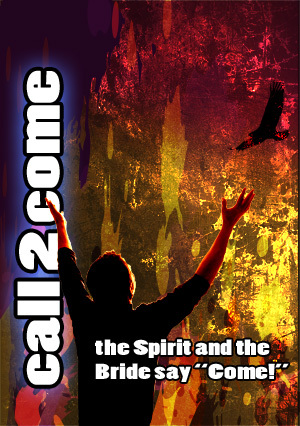 Kenneth is now being prepared as a young prophetic apostolic leaders in Call2Come. He has a passionate desire to raise the Youth as an army of Prophetic leaders who know their Bridal identity, mandate and anointing. There were Christian Leaders from many South American nations ….Uruguay, Paraquay, Argentina, Venezuela, were also present. 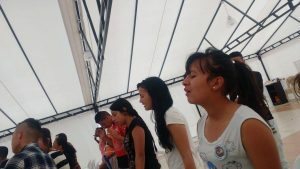 In addition there were about 80 youth from Colombia who just loved to worship. Alvaros contribution at the conference was to encourage everyone to reach for a deeper experience of Christian Unity and warn those attending of the judgement of God coming upon the corruption and self seeking agendas within the Church today. Howard’s mandate was to share about our End Time Bridal identity and how everything is all centred around Jesus deep desire to awaken His Bride to whom she is and to see her get prepared for the Wedding of the Lamb that He is returning to earth to take Her to. He showed how all missionary activity and evangelistic outreach was to be seen in this context because reaching the lost for Christ is to offer them Salvation and so offer them inclusion in His greatest of all creation….His precious Bride. It was so good to be together for these days of teaching and many both young and old received these new challenging revelations with joy. There was much love and humility around and great unity and grace. At one point a dear brother invited us all to sit and allow him to wash each of our feet. Howard was asked to pray and minister the Holy Spirit to each person and the Lord moved powerfully amongst us. Normally at the end of a conference we plan to have a plenary or a ‘Where do we go from here?’ session. This time the Lord Himself orchestrated it and took us by surprise. 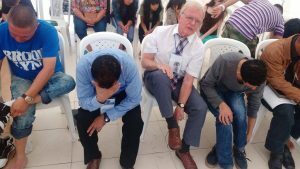 I was sitting in the circle of the leaders from the many South American nations represented at the conference and I heard to my delight the chairperson declare that he felt strongly that the message of the Bride was the ‘now’ message for the Church today and that this was the Time and Season for South America to receive and embrace this message. 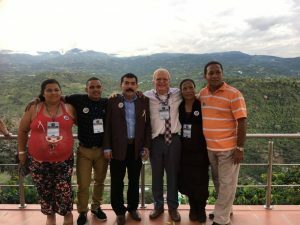 More than that, he suggested that a conference declaration be written and signed by everyone stating that belief and declaring their intention and their commitment to spread that message throughout the S American Continent. This was agreed, the declaration was written and signed by all present. This is also available in a Live or recorded version on the website or on Facebook and WhatsApp Social Media platforms. 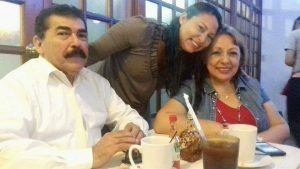 We are also willing to visit each nation and share what God has revealed to us about His eternal purpose and the Bride of Christ. We felt that this ministry trip had certainly achieved its goal and returned to the UK very satisfied.